Steel Legend represents the philosophical state of rock-solid durability and irresistible aesthetics. Built around most demanding specs and features, the Steel Legend series aims at daily users and mainstream enthusiasts! Providing a strong array of materials/components to ensure a stable and reliable performance. A motherboard that fulfills every task – with style! 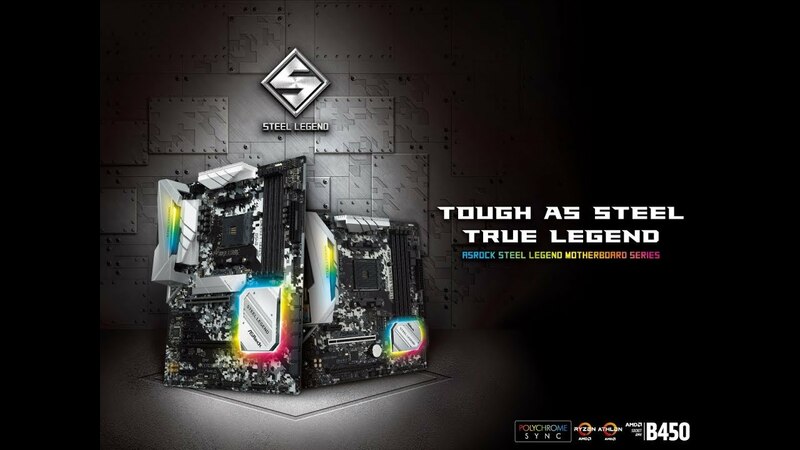 Steel legend motherboards deliver stunning performance and superior aesthetics to rule your own colorful lighting way! ASRock offers a very comprehensive control to perform the built-in RGB LEDs or the connected LED strips, CPU fans, coolers, chassis and any RGB devices smoothly. Devices can be synchronized across the Polychrome RGB Sync-certified accessories as well. Two of the world’s fastest M.2 slots. One delivers up to PCIe Gen3 x4 32Gb/s transfer speed, the other one supports PCIe Gen3 x2 & SATA3 6Gb/s mode. Good M.2 SSD protection is important for longevity and stability. ASRock provides a completed M.2 armor solution on B365 platform that makes SSDs to run in a certain low temperature. +5V voltage is transferred from the +12V. Supplying enough current to USB devices without dropping voltage directly from the PSU. Protect mouse/keyboard against static electricity, especially lowering the chances of USB mouse lag or stuttering. USB speaker is suggested to be connected via Ultra USB Power ports to perform the pure current and offer high audio quality without distortion. ASRock’s premium 60A power chokes effectively make the saturation current up to three times better, thus providing enhanced and improved Vcore voltage to the motherboard. Please refer to below table for AMD non-XMP memory frequency support. For more details, please refer to the QVL on ASRock's website. *Ultra USB Power is supported on USB3_34 ports. ACPI wake-up function is not supported on USB3_34 ports.